Syrian Officials Claim They Will Soon Have Baba Amr 'Cleaned' : The Two-Way There are ominous reports from the district in the city of Homs, which has been under siege for weeks as President Bashar Assad's forces go after opponents. 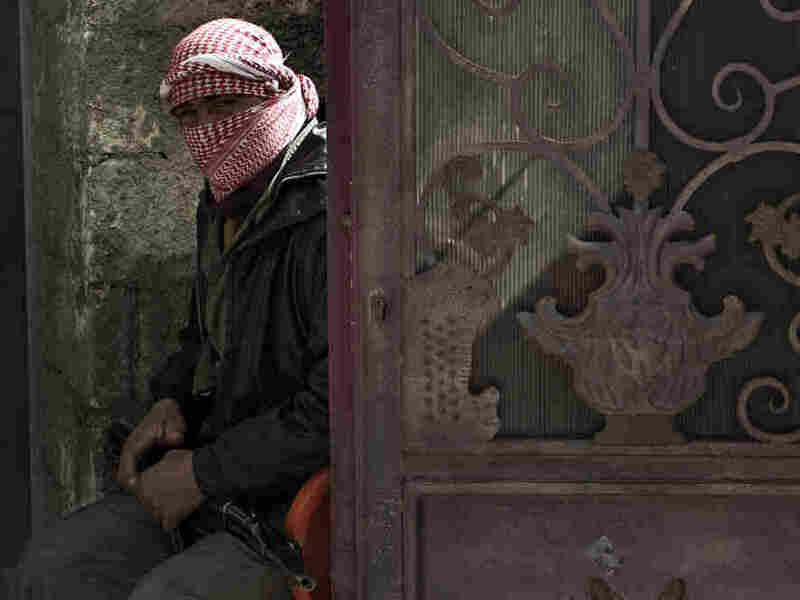 In Qusayr, Syria, on Tuesday, a Free Syria Army member was on guard at the funeral of a man who activists say was killed by government forces. "The Syrian army is advancing on opposition positions in Homs, which has been under artillery bombardment for nearly a month, reports say. Security officials said the city's besieged district of Baba Amr would be 'cleaned' within the next few hours." As always, because few journalists are inside Syria, finding out exactly what is going on is difficult. The Guardian's live blog reports that "a number of trusted sources have told my colleagues Martin Chulov and Peter Beaumont that that a ground invasion has not occurred." But there are also numerous reports of an "invasion" about to begin. Tuesday, according to reports, at least 13 activists died when they were attacked by government forces as they tried to help some wounded journalists get out of the country. As The Guardian writes, and as Eyder posted Tuesday, Sunday Times photographer Paul Conroy was able to get out to Lebanon. Conroy was injured in the attack last week that killed American journalist Marie Colvin and French photographer Remi Ochlik.